In my earlier entry, Catching the Run-off, I mentioned small, obtainable goals, such as the ones listed in 40 Tips for a Better Life. My problem appears to be that I set big hairy goals, which in and of itself is not a bad thing. It’s when I get so impatient with my progress that the frustration and discouragement sets in – that’s the bad thing. I frequently discount small bits of progress as insignificant. 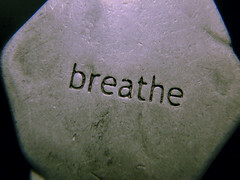 Take learning how to breathe for example….